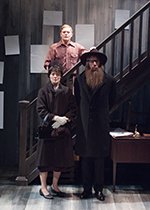 Timeline Theatre presents the Chicago Premiere of MY NAME IS ASHER LEV. Art?! At what cost to the artist?! Award-winning novelist Chaim Potok explored a painter’s obsessive turmoil. A conservative Jewish boy must express his artistry despite its opposition to his religion, community, and parents. Playwright Aaron Posner boils down the essences of Potok’s novel into a tightly woven depiction. Posner’s play centers the action around crucial flashbacks of Asher Lev’s childhood. In post WWII Brooklyn, Asher is compelled to paint the world as he sees it… ugly in its persecution of people. Under the direction of Kimberly Senior, Alex Weisman (Asher) is the tormented painter. Weisman engages as the skillful narrator. He sets up the flashback as the older, cynical Asher and then he nimbly steps into the scene as his younger version. As a six year old, Weisman is precocious with questions for his exasperated mother played by Danica Monroe. Later when Monroe is catatonic in grief, a ten year old Weisman tries to placate her with his forced drawings of flowers. Watching Weisman wrestle between ‘who his parents want him to be’ verses ‘who he actually is’ is poignant and heartbreaking. At one point, Weisman tries to suppress his creative urges. His whole body tenses up. His fists are clenched. His face is reddened with anger. We can see the internal implosion ready to blow his yamaka off. Lawrence Grimm (The Men) is equally impressive playing a variety of Jewish men with distinction. As the papa, he is quietly dismissive of Asher’s hobby. As the mentor, he zealously motivates the controversial creations. As the Rebbe, he delves out life decisions with steady confidence. As the uncle, he has a playful enthusiasm. Grimm morphs into a character sometimes within moments. He exits the stage to quickly don a beard but it’s unnecessary. His mere presence in the character is perfectly identifiable. Senor stages this on Brian Sidney Bembridge’s multi-functional two level set. On the main floor is the day to day family life. In the loft is Asher’s studio. In between, a staircase becomes the bridge between his family and his art. Throughout the show, Weisman hangs blank pieces of paper serving as his art. His life work literally separates him from his parents. In the most powerful scene of the show, Weisman observes his parents‘ reaction to his art opening. They don’t make a sound but the physical moment is unforgettable. The parental conflict is subtle and overwhelming at the same time. What comes first for a Hasidic Jew? Love of son or commitment to religion? Although the answer may seem obvious, Senior makes sure it isn’t by building the emotional 2000 year defense into a ninety minute play. MY NAME IS ASHER LEV is a thought-provoking tribute to both the uncensored artist and religious traditions that must coexist. For more information and reviews on Chicago theatre, visit Theatre in Chicago.